HZS60 concrete batching plant is a set of concrete production of special machinery, to produce various specification, label the high quality of concrete.It widely used in concrete construction of industrial and civil building engineering like roads,railway,bridges,water projects,docks,airport; It is also as a complete set of equipment in commercial concrete factory or concrete ready-mix factory. HZS60 concrete plant reduces the waste of all kinds of raw materials. All sorts of quantity are very accurate for HZS60 concrete plant and many devices were closed, so there is no necessary waste because of volatile or drop. Compared with manual operation, HZS60 ready concrete plant can save a lot of cost. At the same time, it also reduces the manpower, and gives further safeguard for workers’ health. 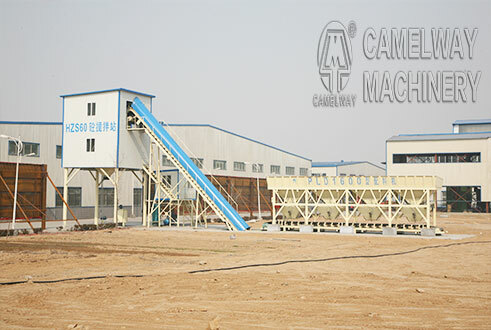 This equipment is made by mixing system, sandstone ingredients system, water supply system and admixture, cement conveying system, electrical and pneumatic control system and other parts.The four types of sandstone material can be automatically weighing;Automatic transmission measurement on water and admixture.All concrete mixing process implements the automatic control and manual, semi-automatic,and mixing counting control function.